That was back in July. Late last week, the commission – whose members include the former home secretary Jack Straw, the man who dismissed his introduction of FOI as one of his biggest political mistakes in his autobiography (and as the man who was foreign secretary at the time of the Iraq war…) – held a briefing to encourage people to submit their views on the Act. 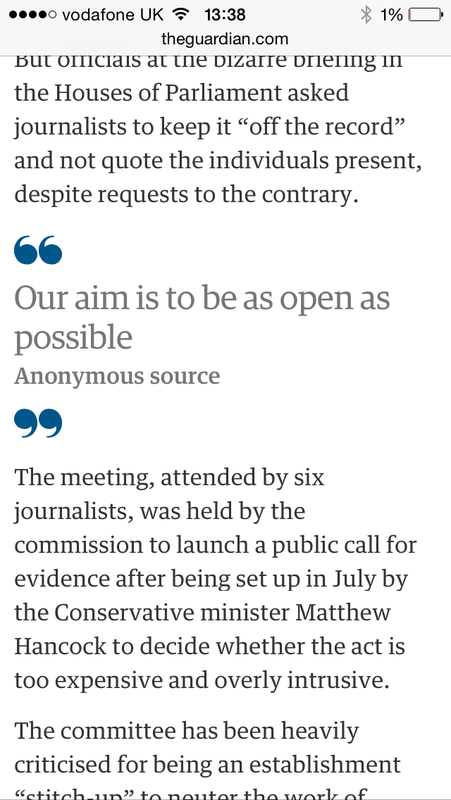 The six journalists who attended, according to the Guardian, were asking to keep quotes anonymous – an action which hardly supports the opening stating of the commission’s founding press release: “We are committed to being the most transparent government in the world – and were also told one item up for discussion is payment for requests for information. The five-member committee includes: Jack Straw, the former foreign secretary, who is already on the record calling for the act to be rewritten; Lord Carlile of Berriew, who accused the Guardian of “a criminal act” when it published stories using National Security Agency material leaked by Edward Snowden; Lord Howard, whose gardening expenses were criticised after being exposed following FoI requests; and Dame Patricia Hodgson, the deputy chair of Ofcom, which has criticised the act for its “chilling effect” on government. They are also all people who have experience of being on the receiving end of FOI requests, rather than using it to get information. That is a basic failing of a commission which is supposed to be open-minded. The fact it took them two months to decide if they intended to consult publicly speaks volumes. But how open-minded can we expect the commission to be when it comes to considering submissions about the Act? If Mr Straw – who was arguably the ‘biggest name’ in my contacts book when I worked at the Lancashire Evening Telegraph – and his previous comments are to be taken as some sort of guide, the answer is: not very. Mr Straw said some critics of the commission would complain even it were “chaired by the Archangel Gabriel”. That, sadly, is typical Straw. Typical New Labour in fact. In many ways a master politician, and a rare example of a minister who still cared about his constituency, Straw’s weakness was his New Labour’s biggest one too: People with an opposing view were too often discounted as being wrong. It’s why the rise of the BNP took so many in Straw’s Blackburn Labour Party by surprise, but didn’t shock those who listened to what was actually being said by those around them. The Campaign for FOI wouldn’t object to any review of FOI, as Straw suggests. In fact, the Campaign would argue FOI legislation does need a review. It needs to encompass more organisations. It needs to strengthen the ability to force government bodies such as the Cabinet Office – now in charge of FOI – to respect the Act, and actually respond. It would also point that this was reviewed just a couple of years ago. Straw surely knows this. But it’s just easier to cast a slur. That’s the not the action of someone who is able to be openminded about FOI. Straw has pledged to be as ‘open-minded as possible’ about the Act. His actions to date suggest he can’t be very open-minded at all. That should worry us all. The burden on public authorities: This is the back door to restrict access to information through charges to tighter rules around the time spent finding information. The burden would be much lighter if councils and government departments kept better records, were more open with information in the first place, and worked harder to make FOI a smoother process for everyone. It doesn’t need a commission to solve those problems. It takes common sense coupled with a desire to really have the most transparent government in the world. What’s abundantly clear through the creation of the commission is that both that common sense and desire are lacking in Westminster. Everyone likes accountability until they are the ones who are accountable, or so it seems. Make no mistake, FOI faces its greatest threat yet. This is little more than an attempt to seal off the state from the scrutiny it is obligated to be subject to. How the commission handles the public responses will reveal just how open-minded they really are. My gut feeling is not to expect too much. Only volume of opposition can help stop this. Details of the commission’s call for evidence can be found here.